Copperbelt police armed with guns and teargas canisters yesterday harassed Forum for Democracy and Development (FDD) President, Edith Nawakwi and disrupted her Party meeting. This happened around 16:00hrs when Police officers from Kansenshi Police Station were phoned by some PF officials that Nawakwi was having a meeting with FDD officials at the FDD Ndola Secretariat at 14 Chinika Street in Kanseshi. About 10 police officers from Kansenshi Police Station moved in and demanded that Ms. Nawakwi who was at the time addressing the FDD Party officials from the four Constituencies of Ndola stop the meeting and accompany them to Kansenshi Police Station for questioning. The police told Nawakwi that she had breached the Public Order Act since she had not ask for permission from the Police to hold the said meeting. But Nawakwi ignored the Police and continued addressing her Party officials. The police told Nawakwi to stop the meeting and follow her to the station. At this time FDD officials started singing Pro-Nawakwi and anti-police songs. Realizing that he was not making any progress the officer in charge of the operation called for reinforcement. Within a few minutes police officers from Ndola Central Police in company of Officer-In-Charge a Ms. Chisenga arrived at the FDD Secretariat armed with guns and teargas canisters. Meanwhile some PF cadres and officials converged at the FDD Secretariat demanding that they cease Ms. Nawakwi for holding what they termed a dark corner meeting. But the FDD youths confronted them challenging them to leave their premises. Realizing that they were outnumbered the PF members backed off. After realsing that they were outnumbered and that Ms. Edith Nawakwi remained uncompromised, the officers decided to let her finish the meeting. After the meeting ended Nawakwi asked the Officer-In-Charge, Ms. Chisenga to join her in the FDD office. Ms. Chisenga in the company of her fellow officers went inside and met with Nawakwi and some FDD officials. 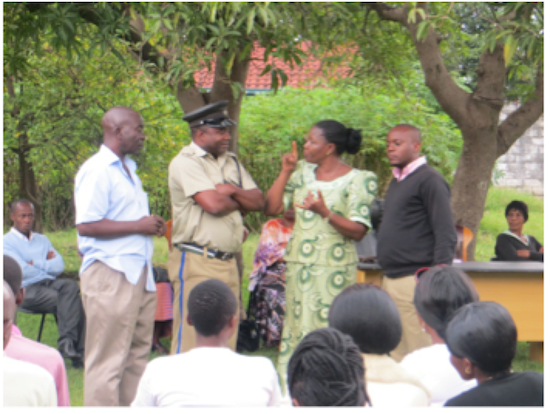 Ms. Nawakwi explained to the Police that she was dismayed by the conduct of the police. “I am totally dismayed by your uncalled for behavior. How could you honestly disrupt a peaceful indoor meeting like this one? This is our Party Secretariat and surely you don’t expect us to be notifying the police every time we meet here. These are our offices. I know that you are under pressure but what has disappointed me more is that you, officers of the law can stoop so low to start getting orders from PF Officials and PF cadres. You are supposed to be professional men and women and not stooges for PF.” However, Ms. Chisenga did not take kindly to President Nawakwi’s sentiments and stormed out of the office saying she could not discuss anything with Ms. Nawakwi; her juniors who were visibly shocked by her bolting out of the meeting followed her. Ms. Nawakwi and her members from Lusaka were the last to leave the premises.